Give a kid a fish, and you'll feed him for a day. Teach the kid how to fish, and he'll starve to death. 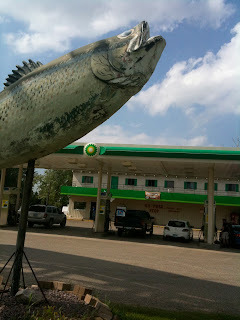 When I was a kid, I went to Lockport on a fishing trip with my friend Richard and his dad. None of us was much of a fisherman, but Richard's family was fresh off the boat from England and eager to experience Canada. So: off we went. Richard and I spent the better part of the day standing at the side of the river, fishing rods in hand, waiting for a fish to bite. Behind us, Richard's dad - in a frock coat and deerstalker - paced back and forth, smoking a pipe and saying nothing. Finally, at the end of the day, a big, dead fish came floating by, and Richard was ecstatic. "Dad - we could pull the fish out of the water, and tell mom that we caught him. Can we do it dad?" Richard's dad stopped pacing, carefully considered the request, and proclaimed, "There will be no pretension!" He continued pacing behind us, as the sun set and our stomachs growled.